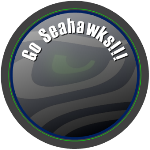 Edit 2008.01.14: The original post was created as an offering to help the Seattle Seahawks defeat the Washington Redskins in the 2008 playoffs. It did…and they did. But it would have required Visio text on a five-dimensional object to overcome Green Bay in the snow. Seahawks: RIP 2008.01.12, Lambeau Field, Wisconsin. Original introduction: I hinted that Santa might deliver, but Art reminded me that Christmas is long gone and V2 still wasn’t here! So I’m placing version 2 on the “alter” today, with the hopes that this offering might please the NFL gods and help our beloved Seahawks triumph over the Redskins. Perhaps we’re in luck. As I type, Njord and Thor have turned the skies gray, and are busy brewing up a most unpleasant wind- and rain-storm — Northwest-style — for our guests today. The new features are accessible via the Shape Data Window (or Custom Properties Window for Visio 2003 and older versions). You can show this window via: View > Shape Data Window or View > Custom Properties Window. Simply select the “guide circle” to see the fields, then edit to your heart’s content! 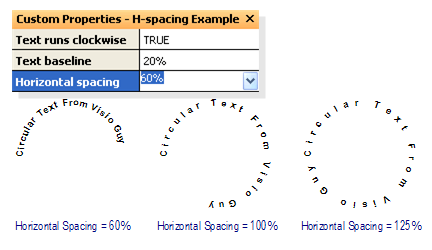 For text that sits right on the outside of the circle, use a baseline of 0%. 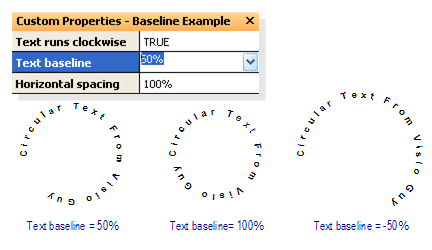 For text that is centered on the circle, use a baseline of 50%. As you increase the value, the text moves toward the center of the circle. Decreasing the baseline value — even into negative values — move the text outward. As with version 1, you’ll need to allow the VBA macros inside of the document permission to run. If you’re not familiar with VBA macros, and the related security issues, please have a look at VBA Macro Security first. Once you’ve downloaded the file, opened the document, checked the code, and enabled the macro code to run, you’ll be ready to rock-n-roll! No idea what is wrong. I just opened the file, clicked the button, and it worked. Can you try it on someone else’s machine? Which version of Visio are you using? I have tried and tried, and I’m not getting the Circular Text Tool. I enabled trust and Macros and can get it to work on document you provide, but not in the document I’m editing. Then if I cut and paste from your document, I can’t move it in mine. I’ve turned off layer protections, and snap and glue, but cannot get it to let me place it where I want it. It is really helpful to read the first article Circular Text Generator (version 1) in order to understand how to use the shape. When you copy generated text, you need to copy the guide along with it. The guide is the dashed circle with the radial line. Without this, the individual letters essentially have no one to tell them what to do! First off… Great Tool! Is there any way to control the spacing between the characters? I see in the shapesheet data the Character Spacing is 0 pt, but the shape looks like there is more than 0 pt spacing. I did try changing the data to something like -2… -5, ect, but some of characters didn’t space property. Example: If you used font style Calibri 12pt, and your string is IDW_CORE, the space between the I and the W is tighter than the rest of the characters. I thought it had to do with the font design of the I, but other fonts acted in the same manner and others equalized the spacing properly. How about using the “Horizontal Spacing” setting described in the last paragraph: “Text Spacing”? Note, you have to select the Guide, not the characters to edit this property in the Shape Data window. I believe that the individual character spacing settings are locked so that the respect the “global” setting value from the guide. This a great tool. Thank you so much. The more I use it, the more uses I find for it. But I do have a question. Is there any way to configure the tool so that the alignment pointer can be centered with the text? By default, it’s “left justified” (for lack of a better description). This is okay for single circles, but it’s very difficult to align multiple. Thanks!! Did you check your junk mail/spam filters? 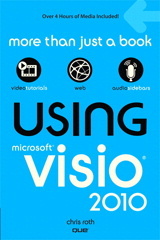 Which version, if any, is compatible with Visio 2003 Professional running on Windows 7? Version 1 and 2 should probably work on Visio 2003, although I haven’t tested. I believe they were developed with Visio 2007. 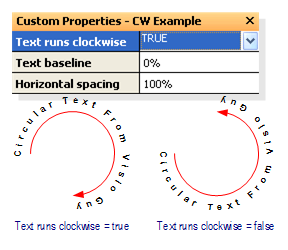 I just tested my vastly-improved, for-sale version, Text on a Circle Visio Shape (which includes a free version with limited features for testing) and it works just fine on Visio 2003. I went ahead and took a chance and purchased version 2 and it works just fine in Visio 2003 Professional running in Windows 7. I guess you can add this to your list of compatible versions. Thanks!